We start off the software tour of the Samsung Galaxy K zoom with the camera. We thought it's a good idea to skip straight to camera as it's the key selling feature of this device. But don't you worry, you would find all the relevant parts of the software review following right after that. 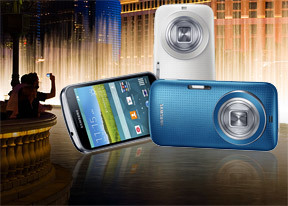 The Samsung Galaxy K zoom comes with the camera of a mid-range point-and-shoot. It has a 1/2.3" sensor with 20.7MP resolution. The camera has a wide-angle lens, 24mm in 35mm equivalent, and features 10x optical zoom with aperture ranging from ranging from f/3.1 to f/6.3 (reached at 8.1x zoom). You have the option to close the aperture (down to f/9 at 24mm). For zooming, the lens gets you to 10x magnification, while digital zoom pushes that to 20x. Generally, we're against digital zoom, but that's effectively 2x digital so we'll give it a shot - we've been pleasantly surprised before, especially when zooming during video capture. There's a powerful xenon flash available plus a focus assist LED for low-light scenarios. Two mics are used for audio capture and you have noise cancellation options - one to cut down wind noise and the other to eliminate noise from the zooming mechanism when shooting video. Speaking of video, the Galaxy K zoom can record video at up to 1080p resolution and for all resolution options you get a choice between 30fps and 60fps. Multimotion lets you slow down or speed up time by up to 8 times. The Samsung Galaxy K zoom interface is very clean with most option concentrated in the Modes button. The whole laundry list of options may take a while to discover as in true Samsung fashion the camera app is chock full of options. For each mode, you get a selection of settings in the left column of the interface. You can drag up to three icons out to be easily accessible. The list of modes is indeed very long and most options are hidden by default, you have to hit the Manage modes button to select which options are visible and which are hidden. The Pro Suggest mode can act as a sort of shortcut, guessing which mode will be appropriate for the current scene and offering you the 5 best matches. Alternatively, Pro Suggest can be used to access My films. Films are camera effect presets that can be downloaded from an online store where users can upload their own film and presets. You can create custom Pro suggest presets too. Shot & More is another auto mode. It's a version of burst shot that automatically looks for certain possible effects. Best photo is always available, Best face shows up when there's a person in the frame. More advanced effects let you erase moving objects or clone them. You can select a mode as soon as you take the photo or you can go back to it later in the Studio app. Selfie alarm lets you shoot selfies with the main 20MP camera, not the meager 2MP front-facing snapper. You adjust a rectangle in the shot (this is where you want your face to be) and turn the phone around to face the back camera. You'll hear a sound prompt when the framing is right and after three seconds the Galaxy K zoom will snap a series of three photos and automatically select the best one (but you can also override this selection). Samsung's Beauty face isn't available for selfies, but it's a separate mode for taking portraits. It has a slider ranging from 0 to 5 for the strength of the effect and it removes wrinkles and generally touches up faces it detects in the photos. An easy way to take selfies from afar is to enable Remote viewfinder. You'll need a separate smartphone with the Remote viewfinder app. The second phone will connect to the Galaxy K zoom over Wi-Fi and serve as a wireless viewfinder. Then there are a selection of panorama modes. The basic sweep panorama is available but you can also shoot spherical panoramas (think Google Street View) and Virtual tours. Virtual tours are not fixed to one location like the other two panorama modes but you can instead walk around. A number of effects also help you with shooting against bright light. There's the standard HDR mode, but you can also do Silhouette shots, Dawn and Sunset shots, snowy landscapes to. To personalize photos, you can add a signature to them - you create a signature image with your finger and then pick where it should be applied (in which corner). You also get Program and Manual modes. Program lets you adjust the Exposure compensation and ISO settings while the aperture and shutter speed are selected automatically. Manual mode makes the Exposure compensation automatic but makes the shutter speed and aperture settings available for manual control. You get the current settings listed on the top row of the display and you can tap an available setting to change it. Instead of the big, thumbable rings of the Galaxy S4 zoom camera UI you get a small, one row slider that isn't very comfortable to control. You get slightly bigger controls and a few more options in the Settings menu (including automatic exposure bracketing). Shutter speed can vary from 1/1200s to 16s, the Aperture is either f/3.1 or f/9 (those values go up as you zoom in), Exposure compensation goes from -2.0EV to +2.0EV and finally ISO can be cranked from a minimum of 100 to 3,200. Now that you're all ready to go and take some photos, you can enable the Photo Suggest feature to view a map with the best photos from Panoramio to find cool locations to shoot nearby. One last thing before we jump into the image quality - the Samsung Galaxy K zoom has 8GB of built-in storage and by the time the OS and pre-installed apps have taken their share, you're left with just under 4GB. During our tests we shot around full resolution 260 photos and about 25 short videos (20-30 seconds) and had 700MB or so storage left free. That is to say you can certainly use the K zoom without a microSD card but if you're going to record a lot of videos you'll need one. Don't forget that apps (games especially) can quickly eat into the storage too.